Manzoor Hussain Parwana is charged for sedition and detained in central jail, Gilgit-Baltistan. Recently he wrote a letter to his three years old son, Anchan Sengge, which is reproduced here. My earnest apologies for staying away from you all and failing to arrange a medical checkup for your five-month old sister, Tongo Zazo. 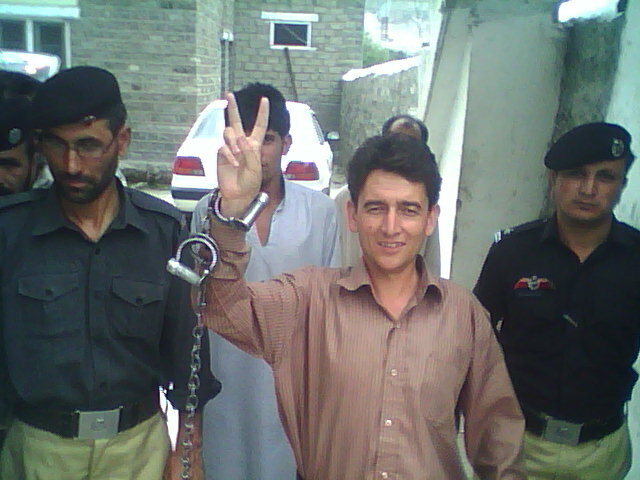 For all these ten days, I didn’t have access to the phone either since I am detained in a jail in Gilgit. Your father is struggling for socio-economic and political rights for the disenfranchised people of Gilgit-Baltistan. Pakistani authorities use brutal force and colonial tactics to suppress such movements. On July 28, 2011, they had once again planned to create bloodshed and mayhem in Gilgit-Baltistan by arresting the political workers. However, your father and his colleagues exposed their conspiracies by remaining peaceful. On that day, I was invited as a guest speaker to talk to the students of Gilgit-Baltistan. During my speech, I talked about corruption, financial embezzlement, nepotism and social injustices which the colonial apartheid regime promotes in the region with impunity. I demanded power to the people, genuine autonomy and a governance system based on justice and therefore I was abducted by the security forces. I demanded re-instatement of State Subject Rule and cancellation of mining licenses to foreign companies including Mohsin Industries and desired locals of Gilgit-Baltistan regaining control over our land and resources and that is why they arrested me. I demanded cross-LOC trade and travel between Gilgit-Baltistan and Ladakh which could also help ten thousand divided family members and they implicated me for treason. I demanded provision of adequate health, education, drinking water and jobs for the local youth and they put shackles on me. My demands offended Pakistani military establishment, bureaucrats and security service agents and they decided to shut me down. As I was coming out of Palace Hotel, peaceful and unarmed, hundreds of para-military and police personnel lurking on the streets encircled me and put me in the ISI detention center to prove their valor and loyalty to the occupiers. You continue questioning your mom about my whereabouts. May be the concept of jail will become clearer to you once you grow up. It is like a state guest house where no one enters and exits with free will. Hopefully one day, I will reunite with you, the way Ladakhi refugees of Gilgit-Baltistan will reunite with their loved ones. For the time being, just know that your loving father is in custody of an unjust apartheid regime, which has no constitutional rights to be in Gilgit-Baltistan in the first place. I will continue to oppose state-led brutality and occupation. I intend to help natives of Gilgit-Baltistan gain freedom from militancy, extremism, terrorism, slavery, religious and ethnic discrimination, corruption, poverty and injustice; and have already placed the burial shroud on me. My path is challenging and long and the destination awaits us impatiently. In this struggle for rights for our nation, we will be victorious. I expect you and Zazo to receive me with garland of flowers and optimism as and when the opportunity arises.